These days, apps make the world go ‘round. And what better way to easily search, order and save on good eats, than with a quick swipe of your smart phone? Easy peasy. So sit back and relax, we’ve pulled the top five, restaurant apps that stand out above the rest. These swipe-worthy apps will allow you to continue your drinking and dining adventures in style and on-the-go. What doesn’t this app do? Well, for starters – it’s the #1 downloaded food and drink app out there. On top of being able to order and pay for purchases before you get to the store, you can earn and keep track of points and rewards, search and find stores, create custom drinks and snag free ‘Pick of the Week’ songs. According to Entrepreneur, this well-known burrito brand has plans to invest over $10 million into improving its technology and already popular mobile app. The updates will include allowing food orders and payments to be made via phone — no standing in line required! 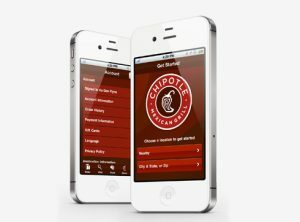 Also, search all Chipotle locations far and wide, save favorite orders and payment info, view nutritional and allergy information and play games to win free burritos — all from your mobile interface. 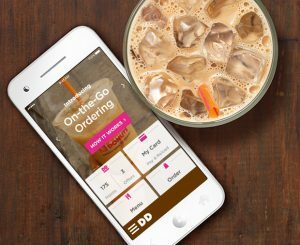 Similar to Starbucks, the Dunkin’ app allows you to order ahead and send your favorite people virtual gift cards. 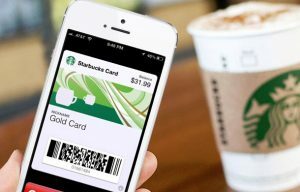 The app differentiates itself by placing a large emphasis on mobile “offers” and provides an array of coupons and mobile codes for its customers. Access the best pizza coupons and deals, and use their ‘Easy Order’ feature to place your order with ease. Create a ‘Pizza Profile’ customized to your favorite tastes and flavors; the Domino’s app saves this information, which expedites and simplifies the ordering process. The final touch? The pizza company has recently made it possible to order pizza using your car, by pairing the app with Ford’s Sync AppLink system. What will they think of next?! Need a sandwich freaky fast? This app is for you. And it has nothing but 5-star reviews! 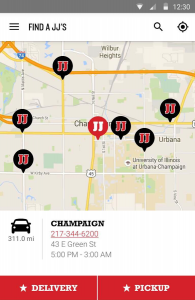 Find a Jimmy John’s near you, place your order for delivery or pick-up, and enjoy a tasty sammie on the fly. Also, catering is still an option – choose your party platters, boxed lunches and party subs for larger meetings or events – and order on-the-go! Stay tuned for the latest and greatest “Top 5” apps each month! Are you a developer looking to create an app similar to the ones above? Meet your customers’ needs and make your app stand out above the rest—MOBILE-DI provides customized mobile strategy and mobile app and web development, for entrepreneurs, start-ups and small-to-mid-sized businesses. 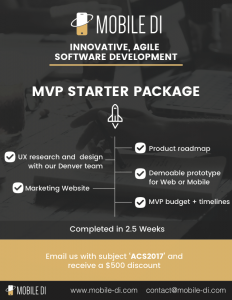 Ask us how we can help with the MVP starter package. 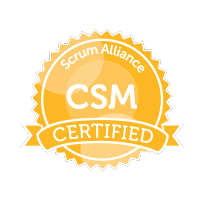 To request more information click the button below. Your partner in technology and digital solutions. Wanna' keep an eye on us? Join our community and receive a monthly newsletter featuring helpful tips for both startups and more-established developers.